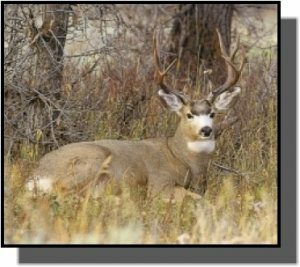 Comments: Mule deer are gray in color and have a short, black-tipped tail, and large ears. When alarmed they are famous for running and springing with all four feet hitting the ground simultaneously. Males have antlers, with characteristic Y-shaped forks, that start growing in spring and are shed in late winter. The breeding season, or rut, peaks in late October and early November. Does usually deliver twin fawns in late May or early June weighing on average 8 pounds each. In the wild, they can live up to 15 years. Distribution: Mule deer range from central Mexico through the western half of the United States into western Canada and southern Alaska. They were once abundant in the shrublands and riparian woodlands of the western two-thirds of Kansas. Nearly extirpated in Kansas by 1900, they are now present in the rolling hills and breaks of the western third of the state. Food: Mule deer are primarily browsers feeding on shrubs and tree twigs usually at dusk and dawn. They also feed on grasses, forbs, grains crops, and alfalfa.